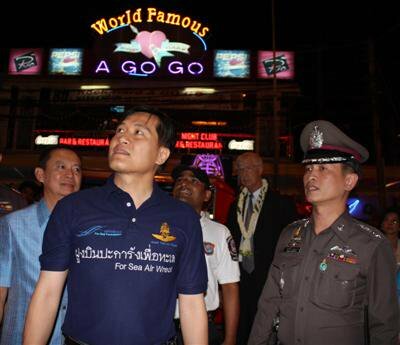 PATONG: Tourism and Sports Minister Weerasak Kowsurat last night greeted tourists amidst the bright lights and booming sounds of Patong’s Soi Bangla, the heart of the island’s adult nightlife entertainment industry. Mr Weerasak was accompanied by Phuket Governor Niran Kalayanamit, Patong Deputy Mayor Chairat Sukban, Kathu Police Superintendent Col Grissak Songmoonnark and a number of foreign ambassadors. The diplomats are on a government-sponsored ‘mega-familiarization’ tour of the Andaman provinces, with stops in Phang Nga and Krabi. While in Phuket, they are staying at the Hilton Phuket Arcadia Resort & Spa in Karon. The tour is intended to ease fears abroad that the region is unsafe for tourism after the unprecedented two-day closure of Phuket International Airport by anti-government protesters six weeks ago. During his walk the charismatic Minister greeted tourists with handshakes and warm “Welcome to Thailand” wishes. The Soi Bangla tour followed a day trip around the island, with the group visiting Chinese shrines to observe the Vegetarian Festival. Some of the diplomat’s family members looked squeamish at the sight of the mah song and their acts of ritual self-mutilation. Other stops in Phuket included the Laem Phromthep lookout point and the ballroom of the Holiday Inn Phuket Resort in Patong, where the minister and other VIPs and dignitaries dined with the ambassadors from Singapore, Italy, Switzerland and Russia along with diplomatic consuls and attaches from many other countries. While the diplomats understood the message that Phuket tourism is not dead even in the depths of the current low-season, they were also reminded that rock ‘n roll also lives on here – in the form of a musical performance by an Elvis Presley impersonator as part of the evening’s entertainments.